Nursing professionals have an array of options to choose from in the pursuit of career advancement. Higher education achievements have the potential to open doors to increased opportunities in the health care industry. Registered nurses with undergraduate degrees may be limited to basic clinical or administrative roles, while those who have earned a Master of Science in Nursing (MSN) will have the additional competencies required for advanced clinical responsibilities and executive positions. Though MSN graduates often have more options than their undergraduate counterparts, earning a terminal nursing degree, such as the Doctor of Nursing Practice (DNP), can result in even more rewarding career opportunities. For graduates who earn DNPs, salaries may also be higher, given their advanced level of education and clinical experience. What Competencies Can MSN Graduates Develop by Earning a DNP? Nurses with an MSN may be capable of performing complex clinical tasks, but DNP coursework will challenge and sharpen their skills. Students can choose between two concentration areas: nurse education and nurse leadership. The core curriculum focuses on advanced general nursing concepts, such as informatics in health care and advanced research methods. Student nurses who choose the nurse education concentration will learn various methods for instructing, assessing, and evaluating student nurses in clinic- or classroom-based learning environments. Those who study nurse leadership will learn nurse leadership concepts that they can leverage when navigating the organizational challenges that nursing departments often encounter. After completing their clinical doctorates, experienced DNP graduates should have the professional expertise needed to be competitive in a range of advanced clinical and administrative nursing occupations. Applicants with terminal degrees are often stronger candidates for many of the following positions, and the DNP may boost their earning potential. Clinical educators are responsible for facilitating the training and development of the nurses working in their departments. To be effective in this role, clinical educators must be able to evaluate their units’ current needs and determine whether the workforce has the competencies needed to deliver the required level of services. This may require working with nurse leaders to find out if their units are facing a skill shortage. If so, the clinical educator can advise the management team to hire new employees, promote a qualified nurse internally, or transfer a nurse in from another department. After management has placed the new talent, it is the clinical educator’s duty to create and implement an effective training strategy. According to the National Association of Clinical Nurse Specialists, these professionals provide diagnosis, treatment, and ongoing management of patient care. Clinical nurse specialists often act as consultants who apply their advanced knowledge of health care delivery processes to ensure that medical institutions are performing evidence-based care in the safest, most effective way. Clinical nurse specialists can positively affect the growth and success of health care organizations. For example, by suggesting more efficient operational strategies, they can help hospitals reduce costs. Likewise, they can use their expertise to positively influence patient health outcomes, contributing to an increased rate of patient satisfaction. Nurse practitioners primarily serve in a highly specialized clinical capacity. They perform advanced clinical tasks in a specific area of nursing practice, such as pediatrics, primary family care, or psychiatric-mental health. They may also assume a range of leadership and administrative responsibilities, depending on the expectations of their employers. 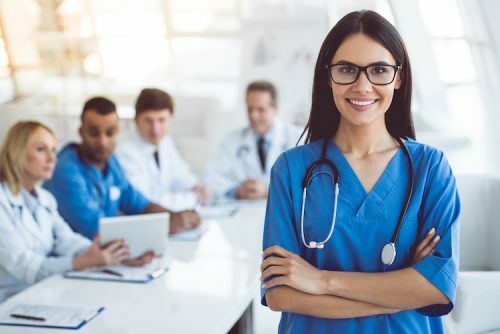 The current minimum educational requirement for becoming a nurse practitioner is the MSN, which qualifies registered nurses to apply for certification and state licensing. The certification requirements vary depending on a nurse’s desired specialization and typically involve a competency-based exam. But the industry requirements are on the verge of change. Prospective DNP students should be aware that the National Organization of Nurse Practitioner Faculties (NONPF) has reaffirmed its interest in making the Doctor of Nursing Practice the entry-level requirement for nurse practitioner roles. Health services managers work with the management teams of health care organizations to help plan and coordinate their daily operations. They do so by managing human resources, organizing finances, and communicating with executives and other internal and external stakeholders. Although this occupation is not specific to nursing professionals, DNP graduates typically have the expertise needed to excel in health services management roles that involve managing teams of nurses or whole nursing departments. Through their experience studying and working in the nursing profession, DNP graduates likely have the knowledge needed to develop and carry out strategies that allow their departments to make reasonable progress toward their objectives. Nurse educators work in health care organizations and on university campuses to develop the next generation of nursing professionals. As university faculty members, they often teach courses that relate to a specialty area that they previously practiced in a clinical setting or studied thoroughly. Some employers may not consider candidates without real-world clinical experience, so it is important to gain several years of nursing experience before pursuing a career as a nurse educator. The National League for Nursing strongly supports doctoral preparation for nurse educators. In fact, according to the U.S. Bureau of Labor Statistics, most large universities expect their faculty members to have doctorates. Aspiring nurse educators should consider earning a Doctor of Nursing Practice to enhance their future career prospects. Nurse supervisors draft employee work schedules and ensure that nursing staffs are distributed appropriately across various units. As leaders, they must ensure that their employees’ actions are in line with the mission, vision, and values of their organizations. This includes observing daily activities to certify that all employees are adhering to any ethical or regulatory standards placed upon them by governing entities. The advanced nurse leadership curricula in DNP programs can equip graduates with the cognitive tools they need to navigate complex health care regulatory systems as they work to motivate and organize their employees. DNP salaries vary based on experience, occupation, and expertise, but in completing a Doctor of Nursing Practice curriculum, graduates prove they have the competency needed to practice at the highest levels of the nursing industry. Therefore, when nurses take a step forward and enroll in a clinical doctoral program, they are also taking a step toward higher earning potential. Place yourself on the cutting edge of nursing practice by earning your online DNP degree from Regis College. Speak with an enrollment adviser today about how Regis College’s online MSN to DNP program can help prepare you for your future in nursing.